SATS (Standard Assessment Tests) tests are given at the end of Year 2 and Year 6. They are used to show your child’s progress compared with other children across the country. The expected scaled score for children is 100. Any child that has a scaled score of 110 or greater is judged to have greater depth in that subject. Pupils are assessed through internally marked tests in: Reading, and Maths. They are assessed by Teacher Assessment in Writing. Children in Year 1 will also complete a National Phonic Test. Any children who does not pass this test in Year 1 are required to be re-tested in the Summer Term of Year 2. Denbigh were broadly in-line with Local Authority and National for the percentage of children attaining the expected standard in Reading, Writing and Maths. Denbigh were above the National figure for the percentage of children attaining the expected standing in Maths. Denbigh were broadly in-line with National for the percentage of children attaining the greater depth standard in Reading, Writing and Maths. Denbigh were broadly in-line with Local Authority and National for the percentage of children attaining the expected standard in Phonics. Pupils are assessed through externally marked tests in: Reading, Grammar Punctuation and Spelling (GPS) and Maths. They are assessed by Teacher Assessment in Writing. Denbigh are above the Local Authority and National figures for the percentage of children attaining the expected standard in Reading, Writing, Grammar, Punctuation and Spelling and Maths. Denbigh are above the National figures for the Average Scaled Score in Reading, Grammar, Punctuation and Spelling and Maths. 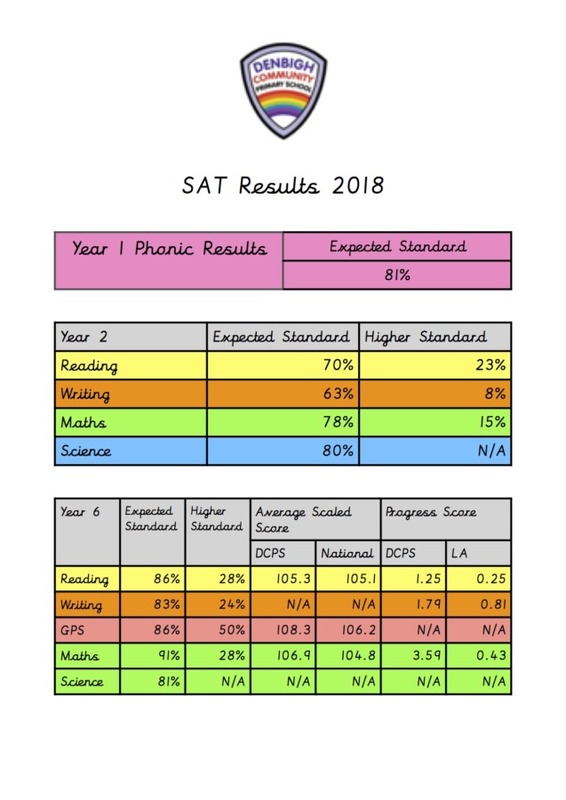 Denbigh are above the National figures for the percentage of children attaining the greater depth standard in Reading, Writing, Grammar, Punctuation and Spelling and Maths. Denbigh are above the Local Authority and National figures for the percentage of disadvantaged children attaining the expected standard in Reading, Writing, Grammar, Punctuation and Spelling and Maths. Denbigh are above the Local Authority and National figures for the percentage of SEND children attaining the expected standard in Reading, Writing, and Maths.